A nourishing, deeply penetrating oil serum with a wonderful texture. BRYT Boost contains our hardworking APS formulation, essential oils including Lemon, Basil, Lavender and Petitgrain, African Baobab Oil and Jojoba Oil. Free from petrochemicals, sulphates, silicones, parabens, phthalates, and GM ingredients. Vegan formula. Created for those times when enough is not enough, and skin needs a long, energising ‘drink’! Applied at night or on a make-up free day, the nourishing formula awakens tired and dehydrated complexions. Cruelty-free. Suitable for tired and dehydrated skin. BRYT Boost blends our antioxidant-rich, free radical-fighting APS formula with other deeply nourishing ingredients. These include Jojoba Oil, known for its ability to be absorbed efficiently by the skin, and African Baobab Oil from the oldest living tree (thought to be 6000 years old), which is intensely moisturising and contains equal measures of palmitic, oleic and linoleic acids, as well as Vitamins A, D and E.
These hardworking ingredients are fused with a very low molecular weight Hyaluronic Acid that penetrates the skin, improving its viscoelastic properties and helping it to retain moisture. Essential Oils of Lemon, Basil, Coriander and Rosemary plus Lavender and Petitgrain, Jasmine and Tonka Bean, enrich the oil making skin feel luxuriously soft and rehydrated. After cleansing with BRYT Cleanse apply 1-2 pumps of BRYT Boost onto your fingertips. Gently tap into the face and neck, firstly by following the hairline down to the eyebrows, then back to the temple continuing along the cheekbone tothe base of the nose. Continue up below the cheekbone then down to the chin, along the jawline to the earlobes. With the remainder, massage into the neck in upwards strokes from base of neck to chin. Allow to soak in for a few seconds before applying BRYT Night (STEP 3). Alternatively, use on a make-up free day when the skin feels tight and thirsty. 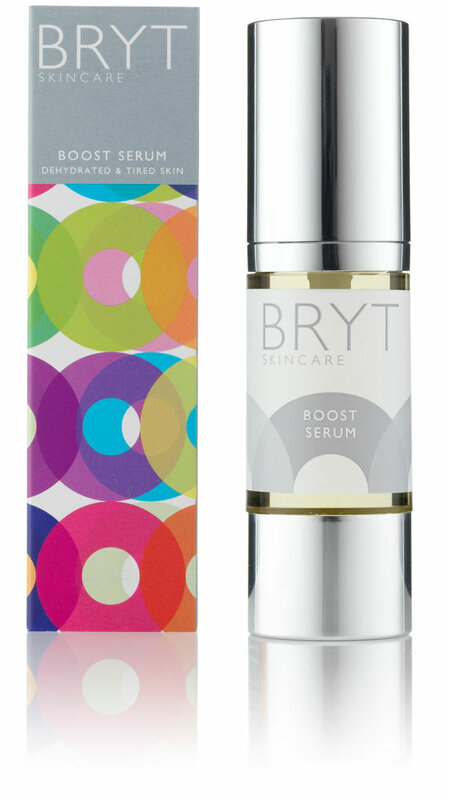 I started using Bryt a couple of weeks ago; the wash, day moisturiser, night cream, Nourish serum - and this Boost serum. It is truly amazing, from the beautiful scent of the lightweight liquid oil texture to the way my skin drinks it in and is immediately softened, smoothed and soothed. I am completely converted to Bryt now! I'm sixty-one, but feel and look a good deal younger! After years in the Australian sun, I have found a product that makes my skin look and feel alive again. Please make one like this for the body. My skin drank in this bath of natural ingredients, smells beautiful and my skin looked great the next morning, such a lovely boost after a tough day at work. Early days but skin feels great and hydrated with this product. I'd also like an eye serum. Would love an eye serum! I find this a perfect in-flight saver. It means that when I land, my skin doesn't need a two day recovery window! A lovely light serum which makes my skin look nourished. Just had a client who thought I was in my 30's. I am 52. Skin is looking good. Thank you.